This is another winner I caught while enjoying cable at the gym. Giada was making this as a dinner for two, so she only used 3 russet potatoes. I followed her lead on portion size and cut back on the quantities listed below, but I didn't have any mozerella or parmesan, so I just used some asiago I had. I also substituted some 2% milk and a little sour cream for whole milk. It turned out delicious! I mean, mashed potatoes baked with cheese and a crunchy bread crumb topping? What's not to like?! Cook the potatoes in a large pot of boiling salted water until they are very tender, about 15 minutes. Drain; return the potatoes to the same pot and mash well. While the potatoes are cooking, pre-heat the oven to 400 degrees. Use the 1 tablespoon of butter to grease a 9x13 baking dish. Set aside. Warm the milk and melt the butter. Stir into potatoes. Mix in the mozzarella and 3/4 cup of the Parmesan. Season, to taste, with salt and pepper. Transfer the potatoes to the prepared baking dish. Stir the bread crumbs and remaining 1/4 cup of Parmesan in a small bowl to blend. Sprinkle the bread crumb mixture over the mashed potatoes. Recipe can be prepared up to this point 6 hours ahead of time; cover and chill. The perfect chocolate chip cookies--Cook's Illustrated's claim, not mine. But, these cookies are truly great. I haven't met anyone who doesn't love them. Heat 10 tablespoons butter in a 10-inch skillet (try not to use a non-stick skillet. I used a light colored sauce pan--you need to see the color of the butter as you brown it) over medium high heat until melted. Continue cooking, stirring or swirling the pan constantly until the butter is a dark golden brown and has a nutty aroma--1 to 3 minutes. Remove skillet from heat and pour into a large heatproof bowl. Stir in remaining 4 tablespoons of butter into hot browned butter until it has melted. Add both sugars, salt and vanilla to bowl with butter and whisk until fully incorporated. Add egg and egg yolk; whisk until smooth--around 30 seconds. Using a rubber spatula or wooden spoon, stir in flour mixture until just combined--about 1 minute. Stir in chocolate chips and nuts, making sure no flour pockets remain. Spoon dough in 3 tablespoon portions 2 inches apart on prepared baking sheets--8 to a sheet. Bake cookies 1 tray at a time until cookies are golden brown and still puffy; the edges will have begun to set, but the centers will be still soft after 10-14 minutes. Rotate the sheet halfway through baking. *Makes 16 cookies, which in my experience is not enough. I'd recommend doubling the recipe, for sure. The first time I heard about Cook's Illustrated, I was in the middle of a group interview for a job I didn't get. Finding out about C.I. was probably the best thing to come of that whole experience, but at the time, I was like, "What? Cook's Illustrated? Like Sports Illustrated? For food?" I didn't really get it until months later when I saw an issue at my mom's house. I became an immediate fan, but at $6 an issue I could rarely afford to purchase a copy. I'd flip through the whole thing at the bookstore and if the ratio of recipes I could use to ones I probably wouldn't was too low I couldn't justify the expense. I did finally resort to checking out their annual compendiums from the library and photocopying the best recipes on the sly. I even started a list of their best-rated gadgets and ingredients in the little black Moleskine I carry around with me everywhere. For my birthday last December, though, some dear friends surprised me with a gift subscription. Definitely the best present of all. I've only received two issues so far (darn those bi-monthly magazines! ), but they're chock full of useful tips and reliable recipes. C.I's May/June issue arrived in the mail yesterday. I wasn't planning on making anything, but as I snuggled in bed with it last night, I came upon The Perfect Chocolate Chip Cookie article. It was late, but I was very intrigued. "Brown butter? Let the batter rest? I have to see this for myself!" And so I did. Whenever I see a recipe I want, I cut it out and paste it in a notebook. I started doing this years ago and now I've nearly filled it up. It's not organized in any way, but I've memorized the order of the recipes from flipping through them so many times. When I need to make something, I scan through all of the recipes until I find a few that sound good. Usually I need someone else to help me make the final decision. This is a recipe I clipped from Bon Appetit awhile ago that kept catching my eye. The first couple of times I saw it, I ended up making something else, but this one wouldn't let me go until I made it. It was rich and delicious--and a welcome departure from our default tomato sauce pasta. Boil your pasta in a large pot of lightly salted water according to manufacturer's instructions. Meanwhile, melt 1 tablespoon butter with oil in a large, heavy skillet over medium heat. Add garlic slices and saute until they've achieved desired crispy golden deliciousness (about 45 seconds to a minute). Using a slotted spoon, remove garlic and set aside. Increase heat to medium high. Add the sage and stir until beginning to crisp-around 10 seconds (although a little longer/crispier would be good, too). Add sausage and saute until browned/crispy in spots. Drain pasta and add to the skillet with sage and sausage. Add the remaining 1 tablespoon of butter. Sprinkle with crushed red peppers and season to taste with salt and pepper. Toss the pasta to mix all ingredients. 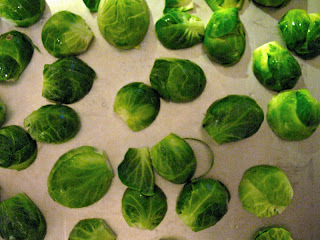 According to Mollie Katzen, these are the brussel sprouts that will convert any non-lovers of brussel sprouts. I put it to the test, and promptly converted Mary Ann, although her disclaimer was she would only eat them if they were prepared like so. My next test case will be the hardest - Andy Zoo. Not only is this recipe incredibly easy, but super delicious as well! Preheat your oven to 450 degrees. Line a baking pan with foil and treat with the olive oil so there is a thin coating all over the foil. Place all the brussel sprouts cut side down on the tray, and smear them around so they get coated with oil on the bottom. 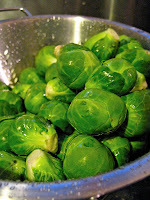 Once oven is preheated, bake for ten minutes, then shuffle the sprouts around again to get them coated with more oil. Bake five minutes more or until done to your liking. They will continue to cook a bit once you take them out, since they will be so hot. When removed from oven, sprinkle with ground sea salt if you like. Prepare to love them, then eat them! I love macaroni and cheese. I love it so much. I love it like a fat kid loves, well, macaroni and cheese. For you Portland readers, there is a particularly good macaroni and cheese at the Hedge House on 34th and Division. The Screen Door also has great mac and cheese that you can get as part of their Screen Door Plate. I think the recipe below, which is in the oven right now and that I got from the book Macaroni & Cheese by Marlena Spieler, stacks up well against both. 1. Cook the pasta until not quite tender. Drain and set aside. 3. Melt 3 tablespoons of the butter in a heavy nonstick saucepan and sprinkle with the flour. Cook for a minute or two, then stir with a wooden spoon. Remove from heat and add the hot milk all at once, along with the bay leaf. Cook, stirring, over medium-high heat until the sauce thickens (about 5 - 7 minutes). If there are lumps, remove the bay leaf and whisk. Remove from heat and season with salt, pepper, paprika, and dry mustard. 4. Reserve 3 to 4 tablespoons of the Cheddar and mild white cheese. Remove bay leaf from the sauce if you haven't already, then stir in the remaining Cheddar, mild white cheese, and bleu cheese and set aside. 5. In a small frying pan, heat the remaining 3 tablespoons of butter and combine with the breadcrumbs. Set aside. 6. In the bottom of a 1 1/2-quart baking dish with 4-inch sides, sprinkle 1 or 2 tablespoons of the reserved cheese. 7. Layer a third of the macaroni in the bottom of the pan, top with a third of the cheese, and repeat the layers two more times, ending with the cheese sauce. Sprinkle with the remaining shredded cheeses, then the Parm, and finally with the breadcrumbs. 8. Bake for 20 to 25 minutes, or until the top is crispy and browned in spots. Yes indeed. If we were in a black church, I'd be hollerin' back at you right now. Today I received my first shipment for my CSA box from Farm Fresh To You and I spent the afternoon researching recipes that would use a good part of the veggies. If you are interested in signing up for this CSA program, I can refer you at a discount on the first trial. After looking through all my Mollie Katzen books (Moosewood) I found one that seemed easy and versatile, Vegetable Chowder. After making this, I realized the veggie portions are more of a guideline, I would use whatever you have on hand. Melt butter in large pot or dutch oven. Add onion, half of garlic and basil, thyme, salt. Satue about 5 minutes until onions clarify. Add potatoes, celery, carrots, broccoli and saute another 5 minutes or so. Add mushrooms, corn and tomatoes, plus lots of pepper. Saute another 10 minutes. Add water, cover and simmer about 15 minutes until everything is tender. Stir in the milk and remaining garlic. Remove from heat. Served topped with fresh herbs. Obviously you can add or subtract depending on your ingredients. I added half a bag of frozed artichoke hearts I had on hand, because I love them! Other good additions are cauliflower, zucchini, etc. Sorry there are not precise measurements for some of the smaller portions, I don't believe in measuring those amounts. It will depend on how much veggies you have. This turned out to be an incredibly delicious soup, very creamy and flavorful. I also picked up a par baked french bread from TJ's and baked it fresh out of the oven, and it was perfect with the soup. Yum! Tonight we're having taco salad "take 2". We made it last night as well, and there is something so satisfying about eating taco salad. Maybe it's because I grew up eating it often. The best part is not having to be confined to a tortilla to get all the goods mixed together, as you are with a taco or burrito. It's not the fanciest recipe on the block but it's what's for dinner tonight, so here we go. When serving this salad, we leave all the ingredients separate, just like when we serve tacos, so everyone can make theirs to order. Prepare the meat with the taco seasoning packet as directed on the back of the seasoning package. Prepare the rest of the ingredients. Set the table with each ingredient in it's own bowl, to have a 'make your own' set up. I combine the onion and lettuce, and the corn and olives. You can use any dressing you like - a salsa, Catalina, or that weird creamy mixture that's red and white mixed together and I'm blanking on the name right now. An alternative to using tortilla chips is frying up a whole tortilla to serve as the base of the salad. Making my own popcorn is my new favorite thing! It's so easy and delicious. You don't need any fancy equipment. I first made a batch with 1 tablespoon oil and 1/2 cup of popcorn kernels. After it popped, I topped it with melted butter and sprinkled it with salt and grated Parmesan cheese. Tasty, savory snack--goes well with good beer. But, my heart really belongs to kettle corn. I found an easy recipe on allrecipes.com and tweaked it a little. I literally ate my first batch by myself, so watch out! It's that good. The website said that white sugar makes it taste like popcorn balls and brown sugar made it taste more like caramel corn. I use a little of both--packed into the same 1/4 measuring cup. Heat oil over medium heat in a large pot with a lid. Add popcorn kernels, then add sugars and quickly stir--keeping the lid covering the pot as well as possible. As the popcorn pops, shake your pot. A LOT. Every once in a while, I lift up the pot and flip it over to try to get the sugar as evenly coated as possible. Any sugar left on the bottom of the pot the whole time will burn. Once popping slows to once every couple of seconds, remove from heat. Keep shaking until the popping stops. I'd recommend removing it a little earlier rather than later, as the sugar will burn quickly if left on too long. Pour into a huge bowl and sprinkle with salt. This was a Sunday dinner dinner. I'd never heard of putting greens in a soup like this, so I was a little skeptical. It took a second to grow on me, but the satisfying, hearty deliciousness of this soup sort of took me by surprise. We made this vegan by using vegetable broth and soy sausages. It definitely worked, but I'm thinking it would be a tad bit more flavorful and amazing with the real deal. Finding real Spanish chorizo is a bit of a challenge--most widely available chorizo in the United States is spicy, mushy ground up parts (like lips, lymph nodes and salivary glands, no joke) that come in a plastic casing. (For dishes calling for that kind of chorizo, I quite emphatically recommend using the very tasty soyrizo instead.) Alternatively, Spanish chorizo--called for in this variation of a Bon Appetit recipe--is made from coarsely chopped pork seasoned with paprika, garlic and herbs. Heat 3 tablespoons oil in a large pot over medium heat. Add onion and cook for about 8 minutes, until translucent. Add chorizo and paprika, stir for 1 minute. Add potatoes and broth. Increase heat and bring to a boil. Add kale and stir until it has wilted and soup returns to a boil. Divide soup among bowls and serve topped with croutons and finely grated parmesan cheese.